The King of Christmas has many aliases. He is elusive, and yet is the most popular part of modern Christmas lore. His reputation exceeds him, and the circumstances around him make him centrically placed in many children's lives. St. Nicholas, a Turkish Monk was the origin. The Dutch call him Sinter Klass. The Swiss call him Christkind. Pennsylvania Dutch people call him KrissKringle. He is known as Father Christmas in England. French people know him as Pere Noel. The Russians call him Babouschka. In America we know him as Santa Claus. Though he was invented by Clement Clark Moore in 1822, Santa is very much alive. Santa is the most famous of any Christmas character. The story of Santa Clause is more known by children than the story of Jesus' birth, the namesake of Christmas. The story goes like this... Santa Clause lives on the North Pole at his workshop. He is accompanied by a population of elves and his wife Mrs. Clause. Over the course of a year each child in the world is examined by Santa to be determined if they are naughty or nice. If they are nice they get a toy that is made at Santa's workshop. If the child is naughty they get a lump of coal. All year the elves and Santa work to create the toys, then on Christmas eve the magic happens. Santa loads the toys in his magical bag onto his sleigh. His 8 flying reindeer then take Santa off into the night to deliver the toys to the good boys and girls. The story is famous, and known by most all children in the world. 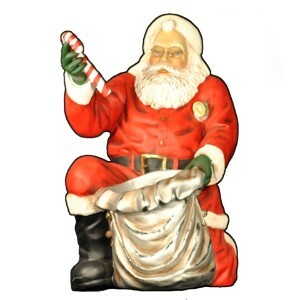 Appeal to the childlike sense of all people with our Life Like Statues of Santa Clause. 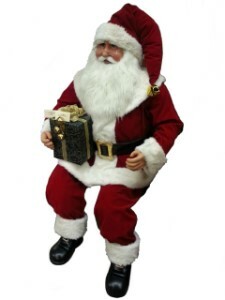 There is a vast variety of different poses, and styles of Santa to choose from. Each piece is made of poly-resin and UV rated for indoor and outdoor use. 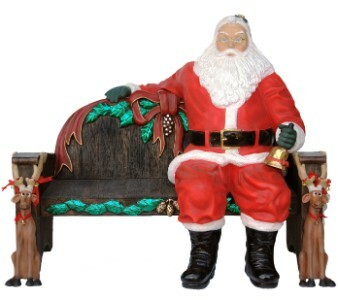 Just like Santa, the magic is real in our statues from the detail, to the color, we are sure you will love your Santa Clause Life Like Statue!